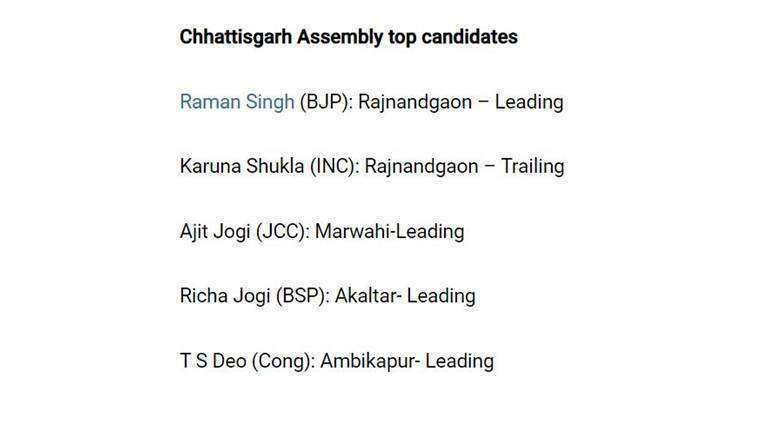 The Congress ended Raman Singh’s dream of a fourth-tenure in Chhattisgarh, by bagging 68 seats in the 90-member Assembly. The BJP, meanwhile, secured 15 seats. Taking moral responsibility for the BJP’s defeat in the state Assembly elections, Chief Minister Raman Singh on Tuesday tendered his resignation to the Governor. “This will not reflect on the 2019 Lok Sabha election,” he said. Much of the focus now is on who will the Congress field as the new CM of the state. Leader of Opposition T S Singh Deo, is widely considered as the frontrunner. The newly formed Ajit Jogi-Mayawati alliance, which was considered as the third front in the state, managed to win 5 seats. Congress is set to form a government in BJP, with an absolute majority. Even as the counting on a seat is underway, the Congress is comfortably past the halfway mark and has won 67 seats. In an embarrassment to the ruling party, eight ministers of the BJP lost. Home Minister Ramsevak Paikra was defeated by the Congress's Premsai Singh Tekam by 44,105 votes, Sports and Youth Welfare Minister Bhaiyyalal Rajwade suffered defeat at the hands of Congress's Ambika Singhdeo, hailing from the erstwhile royal family of Koriya, at Baikunthpur by 5,339 votes. Urban Administration Minister Amar Agrawal was defeated by the Congress's Shailesh Pandey by 11,221 votes at Bilaspur. Public Works Department Minister Rajesh Munat suffered loss to the Congress's youth leader, Vikas Upadhyay, by 12,212 votes in the Raipur City West seat. Minister Mahesh Gagda lost to Congress' Vikram Mandavi from Bijapur seat by a margin of 21,584 votes. 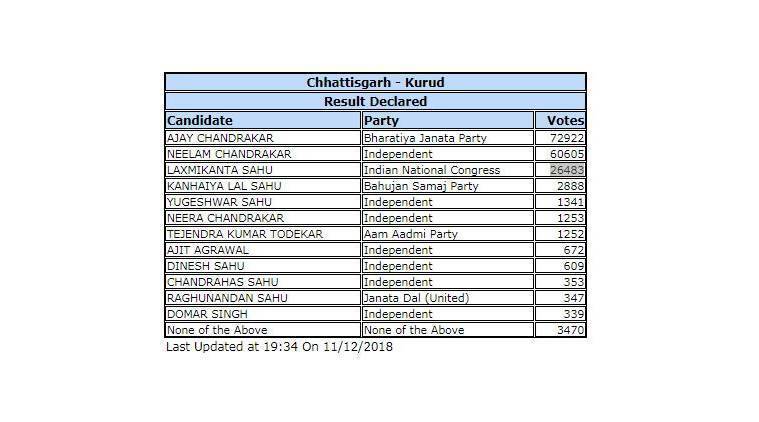 BJP's Kedar Kashyap also lost to Congress' Chandan Kashyap from Narayanpur by 2,647 votes. In Bastar district, Congress' Baghel Lakheshwar was declared as the winner after he secured 74,378 seats. 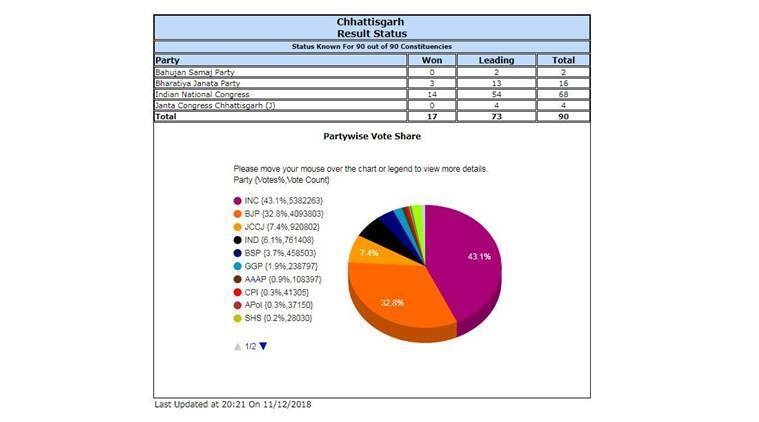 The Raigarh seat too went to the Congress after its candidate Prakash Shakrajeet Naik secured 69,062 votes. Speaking to reporters, TS Singh Deo said, "Such a huge mandate indicates that the people have a lot of expectations from the Congress. The victory that we have got will bind us with the public. Our party will definitely face challenges and work for the development of the public." The Mahasamund and Narayanpur seats were also won by Congress candidates Vinod Sevan Lal Chandrakar and Chandan Kashyap respectively. 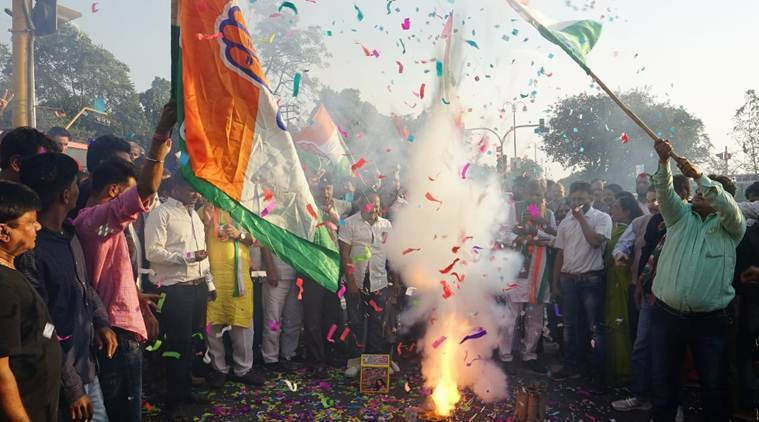 The Rajim and Sanjari Balod seats were also won by Congress candidates Amitesh Shukla and Sangeeta Sinha respectively. In Bindranawagarh, BJP's Damarudhar Pujari was declared winner after he secured 79,619 votes. 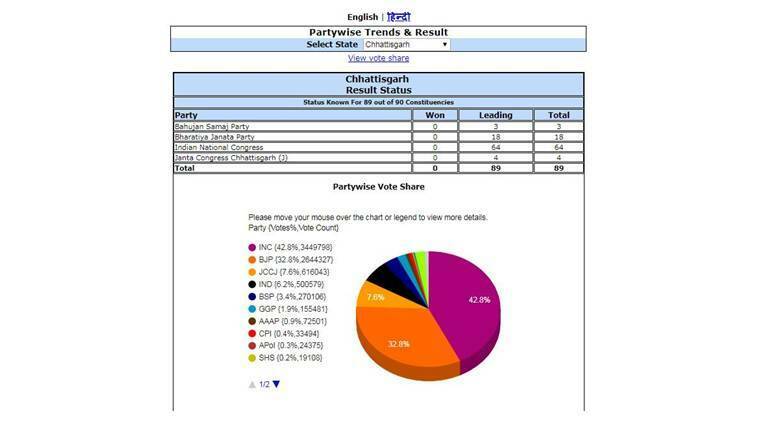 In Beltara, BJP's Rajnish Kumar Singh won with 49,409 seats. The Bijapur seat was won by Congress candidate Vikram Mandavi who attained 44,011 votes. In Dharamjaigarh, Congress candidate Laljeet Singh Rathia was declared winner. The Dondi Lohara seat was won by Congress candidate Anil Bhendia. Congress candidate Kunwer Singh Nishad won the Gunderdehi seat. Addressing the media in the national capital on the party's victory in the elections, Rahul said, "We have defeated BJP in Rajasthan, Madhya Pradesh and Chhattisgarh." 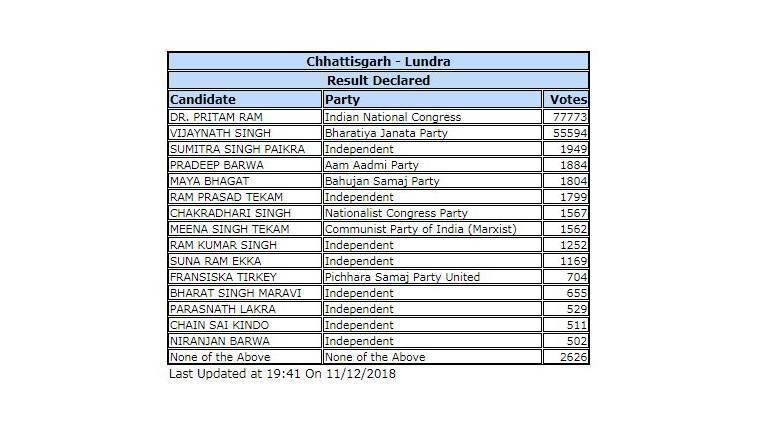 In Lundra, Congress candidate Dr Pritam Ram emerged as the winner after securing 77,773 votes. The Kurud seat was won by BJP's Ajay Chandrakar who secured 72,922 votes. He was followed by Independent Neelam Chandrakar who secured 60,605 votes. Congress candidate Laxmikanta Sahu, on the other hand, won 26,483 votes. Where do the key leaders stand? 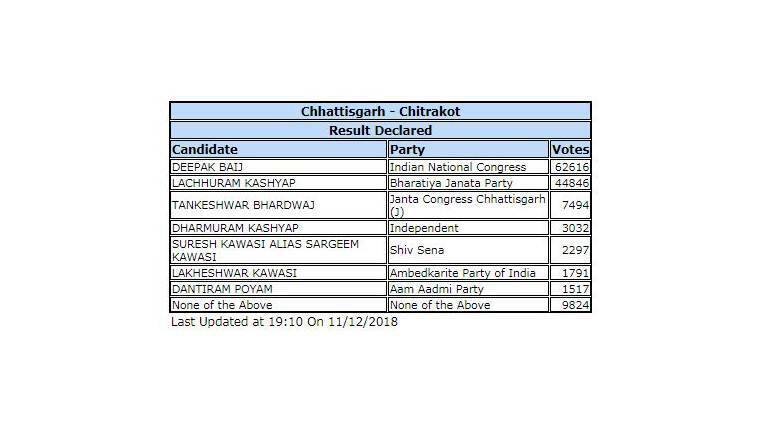 In Chitrakot too, the Congress performed well as its candidate Deepak Baij won by securing 62,616 votes. 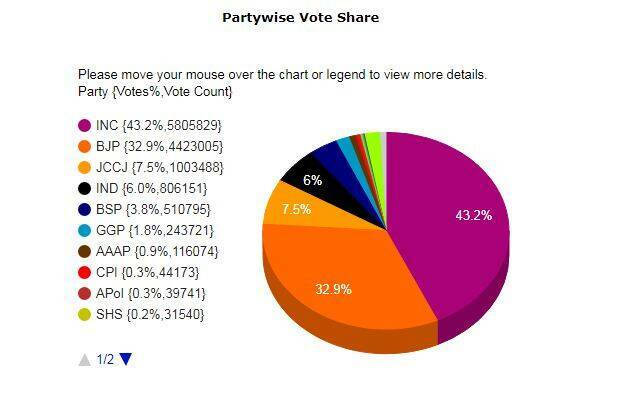 He was followed by BJP's Lachhuram Kashyap who secured 44,846 votes. 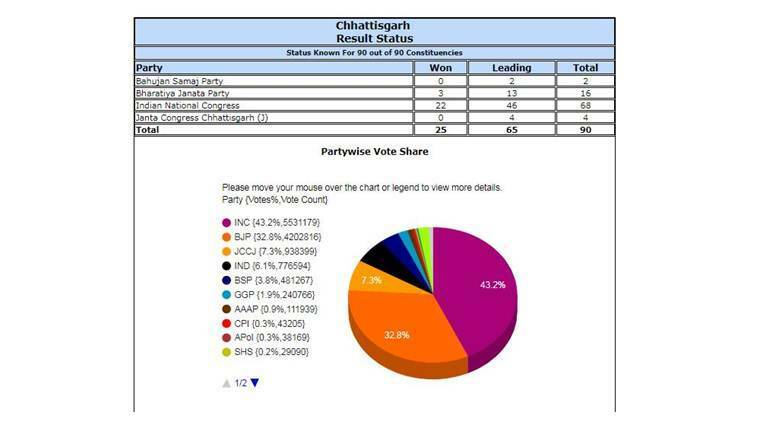 TS Singh Deo, who is widely seen as the CM candidate, has won with 1,00,439 votes in Ambikapur constituency. BJP's Anurag Singh Deo secured 60,815 votes. Key players: Who has secured how many votes? As per latest figures, in Rajnandgaon constituency, CM Singh has secured 47,541 votes while Congress' Karuna Shukla has attained 34,883 votes. In Marwahi constituency, Congress' Ajit Jogi continues to lead with 72,410 votes followed by BJP's Archana Porte who has attained 27,015 votes. A majority of the exit polls had predicted a neck-and-neck contest between the Congress and BJP. The exit polls had predicted that the BSP-JCC coalition may win between three and eight seats, which may help Jogi to emerge as a kingmaker in case of a hung assembly. Taking to Twitter, Congress said, "Democracy has won! Thank you India, you have chosen love over hate, peace over violence and truth over lies. This victory is yours." With counting over in Sitapur constituency, Congress's Amarjeet Bhagat emerged as the winner after securing 86,670 votes. 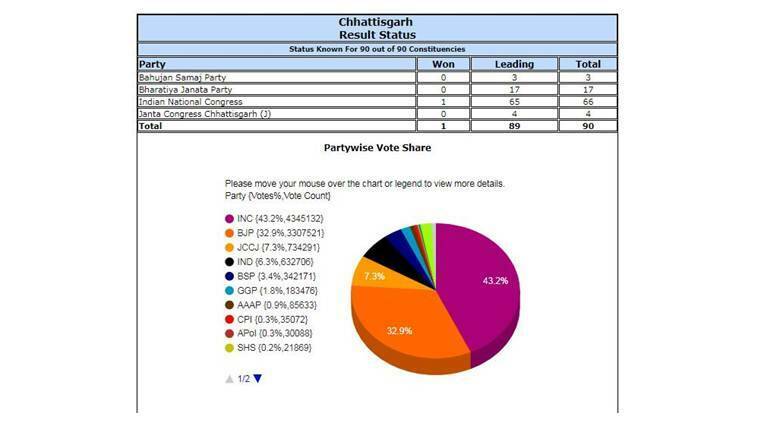 BJP's Professor Gopal Ram secured 50,533 seats while Janta Congress Chhattisgarh's Setram Bara secured only 2,495 seats. Meanwhile, the CRPF jawan, who was injured in an IED blast in Chintagupha in Sukma district and was airlifted to Raipur, has succumbed to his injuries, news agency ANI reported. Addressing the media on the party's victory in the state, state Congress chief Bhupesh Baghel said, "This is a victory of democracy. BJP had a lot of money and a team of corrupt officers; they also had conspirators in their pocket. Despite this, the mandate given by the people in Chhattisgarh is historic." Another Congress leader PL Punia said, "We humbly accept the mandate by the people. They have not given us the right, they have given us a responsibility. They believed the promises we made in our manifesto. The people trusted the words of Rahul Gandhi ji and gave us an agenda, we accept it." Taking full responsibility of the BJP's defeat in the state Assembly elections, CM Singh said he will forward his resignation to the Governor. "I have tendered my resignation to the Governor. We will act as a strong Opposition and work for the development of the state," he added. As per latest figures, in Rajnandgaon constituency, CM Singh has secured 32,613 while Congress' Karuna Shukla has attained 24,713 votes. 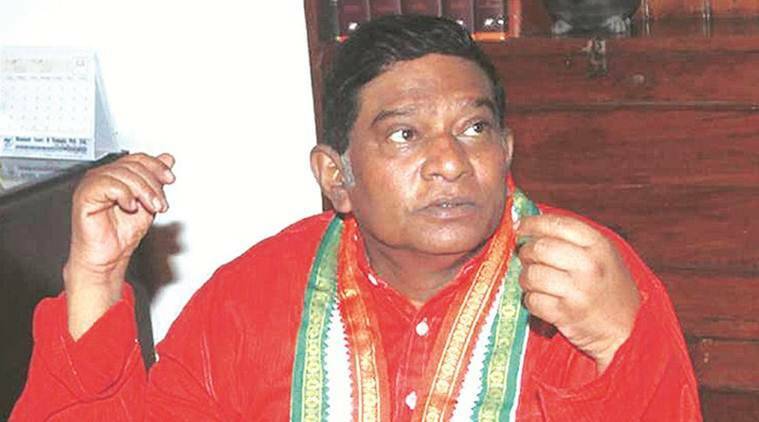 In Marwahi constituency, Congress' Ajit Jogi continues to lead with 62,651 votes followed by BJP's Archana Porte who has attained 24,045 votes. 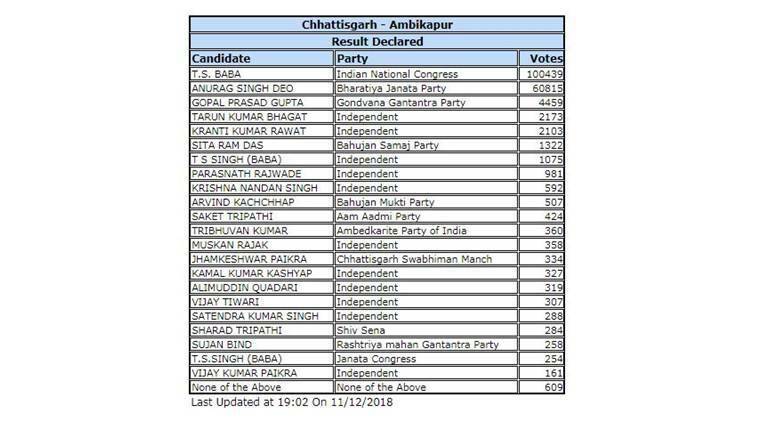 TS Singh Deo, who is widely seen as the CM candidate, is leading with 93,163 votes in Ambikapur. Karuna Shukla, who is the niece of late Atal Vihari Bajpayee and was associated with BJP for 32 years till she joined Congress in 2014, continues to remind behind CM Singh by 7,763 votes in Rajnandgaon constituency. "We strengthened the Congress organisation at the basic level under Rahul Gandhi's leadership and through that, we fought the battle for the common man," Baghel added. The party, he asserted, fought for farmers, unemployed youth, women, tribals and traders and won their confidence. As Congress prepares to wrest power from the BJP after 15 years, the state unit chief Bhupesh Baghel credited the strong party organisation for the impressive showing and said he was not expecting a victory by such a huge margin. "We were not expecting such a big blessing from the people. We were expecting around 60 seats," Baghel was quoted as saying by news agency PTI. Baghel, who is seen as one of the contenders for the CM's post along with TS Singh Deo, said it was for the high command to decide who would be chief minister. "The high command will take a decision on this. The responsibility that was given to me, I have fulfilled that," he said. 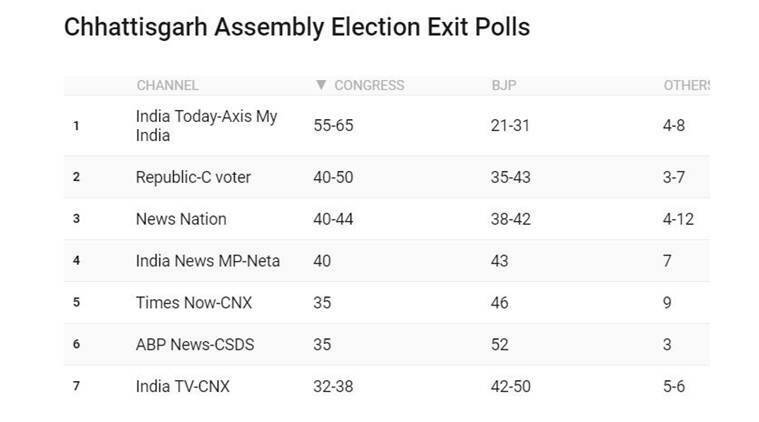 The IndianExpress.com has a LIVE data map of the results coming in from Chhattisgarh as well as constituency-wise data. Click here to view visual data. CM Singh continues to stay ahead of Congress' Karuna Shukla by 5,817 votes. In 2013, Singh had won the elections by a margin of 35,866 votes. Chhattisgarh Assembly Elections 2018 Results: Despite a bandh call given by Maoists in Chhattisgarh, over 75 per cent voter turnout was recorded in the state. Polling took place in two phases - November 12 and 20 to elect a new 90-member assembly. Three-time Chief Minister Raman Singh is being challenged by Karuna Shukla, niece of late Prime Minister Atal Bihari Vajpayee. Speculation is rife that Congress might join hands with the BSP-JCC-CPI alliance to pull the rug from under the BJP’s feet in the state. During the 2013 elections, the BJP had won 49 seats, while the Congress bagged 39. One seat each, meanwhile, was bagged by the BSP and an independent. The polling percentage in 2013 was higher than the turnout in 2018 by over 1.05 percentage points.